Getting pop-up notification can be very annoying and inconvenience especially when you are in the middle of your full-screen game or app. Windows 10 notification or pop-up from other apps could force minimize your current app or game in order to get your attention. So, how can we turn off notification, disable pop-up and enable game mode in Windows 10? 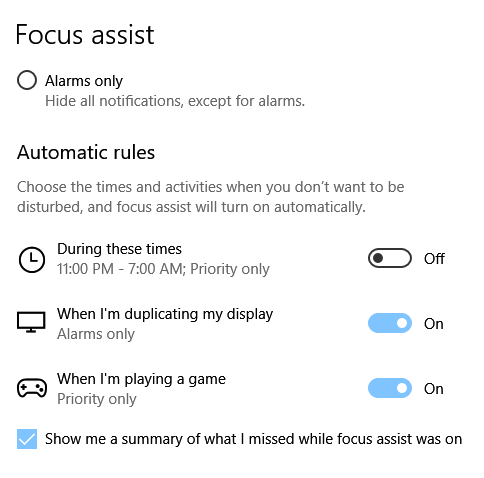 Fortunately, since the new Windows April v1803 update, Microsoft introduces Focus Assist. As its name suggests, it assists you to focus on your work by temporary turning off all notifications and disable pop-ups that could interrupt you. It works as if you have game mode enabled in Windows 10. 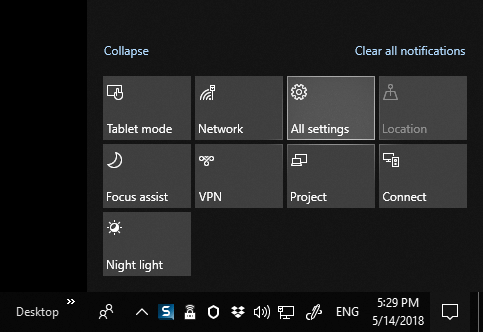 Focus Assist is a feature introduced in Windows April Update. You need the latest update to be able to use the Focus Assist feature. If you haven’t already updated it, run Windows Update on your PC now. When Focus Assist is turned on, all notifications and pop-ups will be disabled and sent to the Action Center instead where you can see them any time after your work or gaming session. To quickly turn on Focus Assist, right-click the Action center (notification icon) at the bottom right of the Windows 10 desktop screen. Select Focus Assist. Then, select either Priority only or Alarms only. To turn Focus Assist off, select Off from the same menu. Selecting Priority only will hide all notifications except those in your priority list. We will talk about how to manage your priority list later in the post. Selecting Alarms only, in contrast, will hide all notifications and pop-ups including those in your priority list, except for alarms. So, if you are in a rush and don’t care what notifications or pop-ups you may miss out, just select Alarms only. 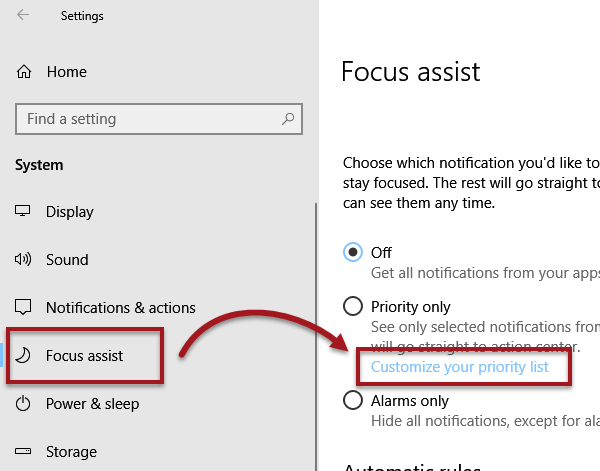 Otherwise, follow the steps below to configure the Focus Assist priority list if you select Priority only. Click on the Action center at the bottom right of Windows 10 screen. Click on All settings at the bottom. From the left pane, select Focus Assist. Under the Priority only option, click on Customize your priority list. From there, you can mange which notifications are allowed. 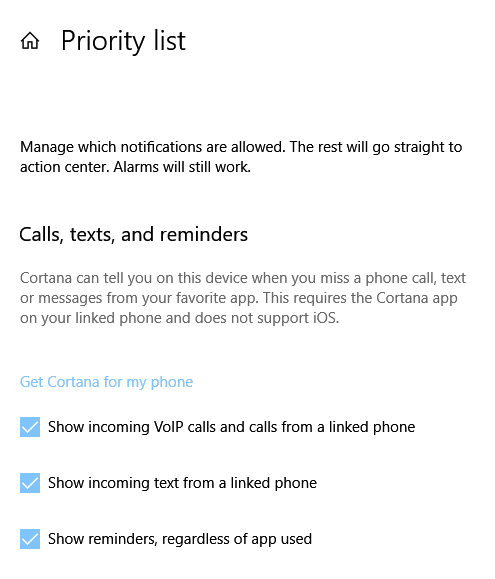 In the Priority list, you can choose which notification you still want to see when Focus Assist is switched to Priority only, such as VoIP calls, texts, reminders or the People app. You can also add any app that would send notifications or pop-ups to the exclusion list. It’ll be like enabling game mode in Windows 10 while still being able to receive notifications from apps of your choice. Keep in mind that focus assist doesn’t destroy your notifications. They will just be hidden and saved onto the Action Center, which you can go back to them any time you want. They will stay there for as long as you want until you decide to dismiss them in the action center. In the Focus Assist setting, you can also set a schedule and choose the times when you want Focus Assist to be turned on automatically. It’s useful if you have a fixed working time and don’t want to be disturbed during this period of time, without the need of having to keep switching the focus assist on and off. You can also choose the activities when should Focus Assist be turned on automatically, such as when I’m playing a game, or when I’m duplicating my display. When the Show me a summary of what I missed while focus assist was on is enabled, just as what it implies, it will show you a summary of all notifications and pop-ups you’ve missed after you turn it off. If you don’t have the Windows 10 April Update, or if you just can’t update to it yet, you can choose to disable the notification of any app in the system setting in Windows 10. To learn more about how to turn off notification or just the notification sound of an app or program in Windows 10, read this: How to disable notification sound in Windows 10. Description for sharing: Getting annoying pop-up notification in Windows 10 while you are in middle of your game or work? Here's how to turn off notification, disable pop-up, and enable game mode in Windows 10.